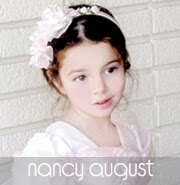 Bridal Bee's Blog on Flower Girls & Beyond: Custom Flower Girl Dresses in Four! Custom Flower Girl Dresses in Four! Fours A Charm for Flower Girls, Update! A few months ago we featured four lovely little flower girls, Nicole, Charlotte, Lily, and Saffi, on our blog and you can find the post here Fours A Charm for Flower Girls. Just recently, newlywed couple Carlie and Sharon Yapp sent us a beautiful professional photograph taken by their wedding photographer! Isn't it sweet? We love the natural surroundings and that little ray of sunshine peeking into the photo. The bride and groom look so happy! Aren't the four flower girls in their Custom Flower Girl Dresses so adorable? 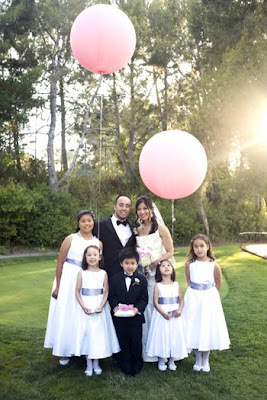 We can't get over those big pink balloons! This photo truly captures the joyful essence of their big wedding day. Thank you to Carlie and Sharon Yapp for sharing this amazing photo with us! Click here to shop our custom flower girl dress collection! Another Baby Pageant Dress Winner! Gianna Showing You Her Best In Our Baby Dress!